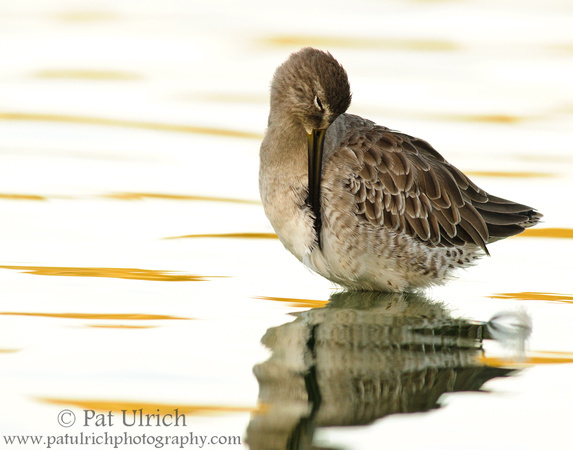 As the sun dropped low in the sky, it slipped behind a nearby building and cast a shadow over this preening dowitcher. In order to the expose for the bird, I had to push the exposure compensation up to +5/3, which left only a bit of the reflected sunset color in the ripples of the water. This high-key exposure worked well to help capture the tranquility of the moment that I shared with this bird along the shoreline. 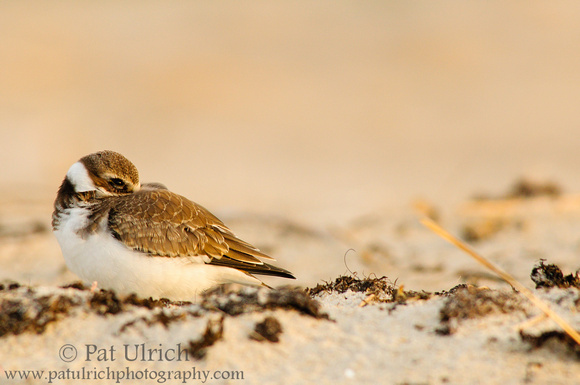 View more of my shorebird photos. My conference was near SFO, so during an evening dinner break in the program, I headed down to Radio Road Ponds for the sunset. I was greeted by the sight of a large flock of avocets when I got out of the car, and after I sat there for a while watching them, a flock of dowitchers flew in and started feeding close to the shoreline. I have no ideal if this is a long-billed or short-billed, but they were fun to watch at close range! 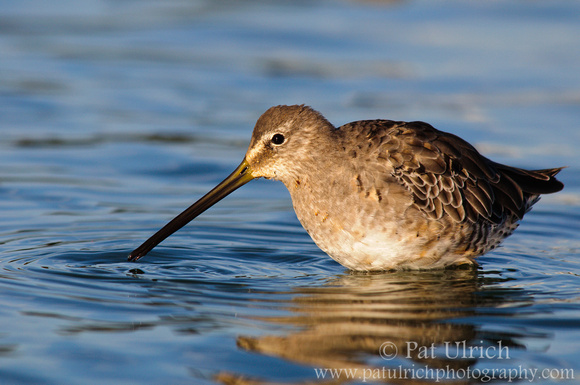 Browse more photos of dowitchers. While I was preparing for my talk at the PSA conference last month, I spent some time digging through my archives. I have a ton of images from California that were only partially sorted and processed, and it was a lot of fun to relive some of my trips to Point Reyes National Seashore. While there were plenty of images that I passed over for a reason the first time, I came across a handful that I was excited to find again. I typically save any image that is sharp, just because you never know when you'll see the advantage of a new or different composition within the frame. I passed over this image many times before, since in the full frame, the fence dominated the image. Eventually though, the light bulb finally turned on for me, and I saw the potential in using a 20x10 aspect ratio. 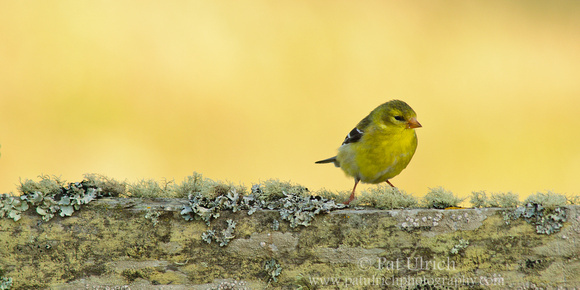 This lovely female goldfinch was perched on a lichen-covered fence railing in the Tomales Point parking lot in Point Reyes National Seashore. There's a male sitting just outside the left edge of the frame that she's intentionally ignoring as he tried to court her. It goes against my usual tendency to prefer subjects that are looking into the frame, but for some reason, this "rule-breaker" works for me. View more of my song bird images. I had the chance to spend a few brief days in California recently, and it felt great to be back. I was invited to give a talk at the annual Photographic Society of America conference, which was in San Francisco this year, and I enjoyed the chance to share a collection of my favorite wildlife images from my time as a resident of the Golden State. It had been over a year since I had left California, and at first it felt a little weird to be a tourist in the Bay Area. I headed straight for Point Reyes National Seashore on my first evening though, and the feeling of home quickly came rushing back! 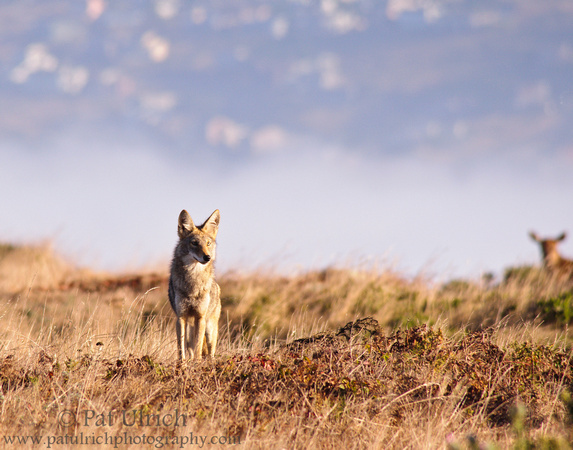 This shot is of a friendly coyote I met one morning along the Tomales Point Trail. By friendly, I mean that it didn't directly run down the hill to disappear -- it first gave me about two minutes to get off a shot. Quite a handsome specimen though, and yes, that's a tule elk watching the scene unfold in the background. View more photos from Tomales Point in Point Reyes National Seashore.